The First Biennial Sino-British Contemporary Art Exhibition kicked off on Tuesday at the Yantai Art Museum in Yantai, East China's Shandong Province. More than 200 visitors, including officials from the Yantai municipal government and artists from China and the UK, attended the opening ceremony. The exhibition focuses on urban design, the revitalization of cities through cultural exchanges and how to meet the human concerns of urban residents. 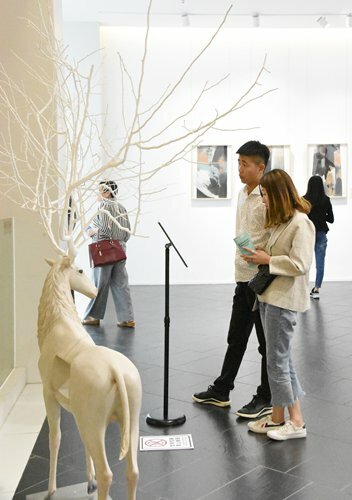 A total of 150 works ranging from paintings and sculptures to photographs and installation works from 39 artists are on display at galleries at the Yantai Art Museum and the Yantai City Art Museum. According to a statement from the Yantai Art Museum and University of Suffolk, the exhibition's organizers, the Sino-British Contemporary Art Exhibition aims to be an important platform for promoting cultural interaction between the two countries and stimulating independent and rational thought among artists in both China and the UK. Yantai and Ipswich in the UK will take turns hosting the biennial going forward. The exhibition is scheduled to come to an end on October 12.